Spring Brook Supply offers the Air-O-Lator line of open water aerators, fountains & de-icers ranging from small to large pond applications. 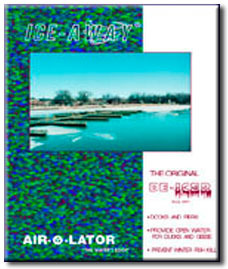 Air-O-Lator Corporation was originally founded in 1961 under the name Roycraft Industries. In 1967 Roycraft Industries, developed the “Original” “Ice-Away” de-icer that is designed to prevent ice formation in marinas and around docks. In 1970 the Ice-Away was further improved to implement an exclusive water cooled submersible electric motor. In 1972, it was discovered that the Ice-Away, while positioning the propeller close to the water surface, performed as an excellent pond and lake aerator and was originally known as the “Air-O-Lator” now recognized as the “Aquarian” aerator with four product lines. In 1973, Air-O-Lator Corporation was formed. Since then the Company has continued to develop new products including the Quantum aerator circa 1978, Inter-Mix mixers, circa 1987 and Font’N-Aire fountains circa 1987 consisting currently of four product lines. Manufacturing of Air-O-Lator products is completed at its facility in Kansas City, Missouri, USA. Air-O-Lator Corporation divides its products into three equipment groups: 1) Aquaculture Group, Aquarian aerators, 2) Consumer Group, consisting of the Font’N-Aire, Legacy, Ready, Platinum, Gulf Stream, and the Aquarian Residential aerator, 3) Commercial equipment group consisting of Aquarian Commercial aerators, Aquarian Quantum aerators, the Intermix Submersible mixers and Aspirators. Air-O-Lator has multiple manufacturer’s representatives and in excess of 400 dealer locations in the USA.